UPDATE: THANKS TO ALL WHO PARTICIPATED! THE RESULTS WILL BE SHARED AT OUR OCT 30 MEETING IN TEKPARK. HOPE TO SEE YOU THERE! ANY QUESTIONS CONTACT HELLO@THEMAREA.ORG OR 484-646-3295. A recent study, Home Idle Load: Devices Wasting Huge Amounts of Electricity When Not in Active Use, found that nearly one fourth of the electricity used in homes was for “idle” loads — wow. 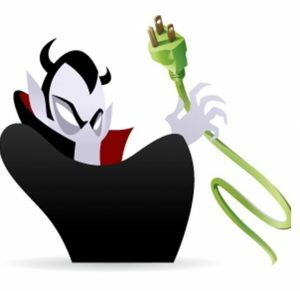 Also called vampire loads, home idle loads include standby loads (things that are on all the time, even when we think we’re not using them or believe they are turned off) and some intermittent loads (like refrigerators, that cycle on and off). In Pennsylvania, this would be the equivalent of about 6 solar modules per household – for idle loads! To achieve 100% renewable energy, addressing opportunities like whole house idle loads is essential. The first step is a better understanding of these loads, then there is much that can be done, often at very little cost or inconvenience. So, how much electricity does your home use when it sits idle? Most of us have no idea. While many of us have used kill-a-watt meters or other devices to measure electricity consumption for specific devices, whole house idle loads have not been widely researched. This is also easy, just requires a little planning and going to the utility meter on your house a couple of times. Look for a time when no one is going to be home for at least 24 hours AND when heating and air conditioning are off. When the last person leaves, go to your electric meter and write down the kWh reading or take a photograph of the meter’s kWh reading. Note the date and time. When the first person returns, to the same thing. Directions and form are here, https://tinyurl.com/MAREA-MethodB (If you have a solar installation, also get before and after kWh readings from your solar production meter, inverter or inverter website.) We’ll use the info you send us to estimate your home idle load, or you can do the analysis yourself and send it to us. Please send any questions or observations to hello@themarea.org. We’d love to hear from you! At our Oct meeting, we’ll share what we’ve all discovered and consider what we can do about those vampires lurking in our midst!